Baal HaSulam, “Introduction to The Book of Zohar”: When you examine the above three states, you will find that one completely necessitates the other, in a way that, if one were to be cancelled, the others would be cancelled, too. The most common and understandable complaint against the Creator is: Why didn’t He create everything in the finished form? Seemingly, what would be easier? Why does He need us to suffer and thus, consciously or unconsciously, curse Him as the cause of our suffering? Why has He created us not perfect, but completely opposite? Why do we become as we develop worse and worse and recognize this over and over again? We become aware of this to the point that this no longer causes uneasiness and becomes routine. So, maybe, the Creator has “overlooked,” “missed,” or “left something unfinished”? How can such imperfect actions originate from perfection? This “customer’s complaints” sound quite fair. On the other hand, if you try to look at the matter from the Creator’s side: indeed, why did He have to create the three states of creation and lead us by the path of great suffering from the first to the third state? How could the second state, the fall from Infinity into our worst contradictory world from which we ascend back, become possible? How can He Himself manage all these systems, to be included, “clothed” in them, so as to manifest various forms of relations and teach us lessons? We understand that parents in our world have no alternative because, as it is said, “the impulse of man’s heart is evil from his youth.” Here, strictness in relation to children is necessary. But why does the Almighty Creator resort to such methods? In short, all the key issues with respect to the created being are focused on his three states, on the spiral from perfection (1) through the system of the worlds (2) to perfection (3), and here lies the problem of life and death, the problem of suffering, completely divorced from spiritual awareness. We cannot justify all this within the framework of our mind. In the first state, created beings do not feel themselves at all; they do not really exist. They begin to manifest themselves as existing to the extent that they attain perfection. By rising from the current state and attaining spiritual degrees, to that same extent, they feel their existence until they rise to their full height, on par with the Creator. Thus, perfection inherent in the first state stems from the third, in which the created being attains it. But at the beginning, they just represent Reshimot, potential, and have to go through a certain process to eventually achieve perfection. This process is the second state. Question: Why can’t I hold on to the feeling of unity, to the “raspberry ball,” it keeps disappearing? Answer: It doesn’t matter if it disappears. We should look at the benefit of our actions and if I can add effort I am happier that it is lost than if I have it, because what I already have is mine. If I stall even for a second in the state that I have achieved, it begins to rot. The moment I begin to enjoy my state, I should understand that it’s an egoistic pleasure. If I enjoy the change of states, the derivative, which means not the speed but the acceleration, the increasing speed of the changes, then it’s the right pleasure. If I simply enjoy the state itself, then it’s already a shell. Just like in physics, a body that moves at a constant speed which may be very high is considered to be standing still, and with regard to me, it isn’t moving. 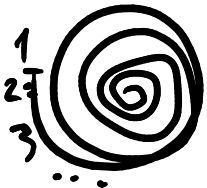 It can be considered to be moving only if its speed changes. So if your speed constantly grows, you can be glad, and it’s a good joy. It’s called “joy of a Mitzvah,” since you are constantly adding, which means that you are raising more and more desires to correction. What’s more, you mustn’t enjoy in a constant state. You should advance like an old man who is bent, constantly looking for a deficiency in order to accelerate his speed. Question: How can we hold the raspberry ball? Answer: The raspberry ball can be held only by the group’s effort and with the help of the Upper Force. We must constantly play with this ball, like dough when baking matzah, which you cannot stop kneading even for a second, until you put it in the oven. It cannot be kneaded longer than 18 minutes: the nine Sefirot of the Direct and the nine Sefirot of the Reflected Light, and then immediately in the oven! Baal HaSulam, “Introduction to The Book of Zohar,” Item 11: For the body, which is the will to receive for itself, extends from its root in the Thought of Creation, through the system of the impure worlds, as it is written, “and [from] a wild donkey a man will be born” (“Job” 11, 12). And he remains under the authority of that system for the first thirteen years, which is the time of corruption. And by engaging in Mitzvot from thirteen years of age onwards, in order to bestow contentment upon his Maker, he begins to purify the will to receive for himself imprinted in him, and slowly turns it to be in order to bestow. By that he extends a holy soul from its root in the thought of creation. And it passes through the system of the pure worlds and dresses in the body. This is the period of correction. The “13 years” that Baal HaSulam speaks of refers to something that has nothing to do with our world. In our world a person is not considered a grownup at 13-years-old, but rather a baby who is still operated by his natural instincts. We don’t expect him to act rationally and to understand what he does or to deeply clarify his actions. Accordingly, there are no laws by which he has to abide. A person actually advances by two systems, since he wouldn’t be able to distinguish the system of impurity without the system of Holiness. So it is actually the system of impurity that manages him along the way. Thus we are under the influence of the system of impurity, the shell, during the first phase of our advancement to spirituality. The spiritual desire to receive in order to receive constantly grows in these worlds, and a person feels its growing dominance. He doesn’t just feel it, but rather feels it with regard to connection and mutual guarantee. All our discernments are with regard to the one vessel, the reconnection into one man as it was before the breaking of the vessels. This is what we are attracted to in our correction and accordingly receive different hardenings of the heart, which means that the Reshimot (reminiscences) are revealed one by one in heavier forms of the intention of in order to receive. This continues until we reach the state of “delighting the Creator.” When a person is able to delight the Creator it’s a sign of the next state, which means that he is already in some level of equivalence of form with Him by being under the influence of the systems of the worlds of BYA of holiness. Question: How can you possible to explain to someone that our lack of balance with nature can affect the biosphere, for example? Answer: All of the universe is one system! The world is global; all the systems are interconnected in it. When you ask how each one of us influences the natural environment or causes a tsunami through his negative thoughts, you are going to the level of the person who says: “Explain to me why there was an earthquake in the ocean, why did a wave come and cover everyone?” Certainly we cannot show this to him. How can we approach people to show them everything? I am in a quandary myself. Therefore it is better to approach them from another side. When we look at society, we see how it’s beginning to suffer, how the former middle class is gradually disappearing by descending to the lower class, and the lower class is already below the poverty line. It’s to these people that we turn. They are not interested in high matters even though they may be educated people; rather, it’s a normal, quiet, and calm existence that interests them. Life has beaten them so much that the ego has narrowed their field of vision to a minimal state: “Give us….” We have internalized such admiration and respect for America, while there are 43 million Americans who are waiting for only one thing: to eat a free bowl of warm soup and get a place to sleep in a hostel. 43 million! In his small circle, the person needs everything to be okay: to eat, to sleep, to close his eyes and not see anything. People who are close to this situation are more sensitive and easily absorb the integral method that we bring to them. Question: But are we bringing them a formula that is already too simplistic? Answer: Why? They are normal people who themselves understand and already feel where humanity is going. And today there are many people like this! These are not people who were born in the colonies (of former prisoners) somewhere, that came out of caves, or down from the mountains; these are normal, educated people. Question: In every system there are deviations that are considered the norm; therefore, it’s doubtful that everything can be ideal in an integral system. Answer: When we begin to be involved in balancing the system through an integral society, we discover that nature enters into an internal dynamic balance with us. It gives us the exercises required for our development, not to harm, but to benefit us. It’s like parents who give a child all kinds of games that present him with a particular goal: assembling a puzzle, Lego set, and the like. It becomes clear to us that nature is intentionally playing with us in order to develop us. Therefore from the threatening conditions we begin to see its subtle relationship and kind face towards us. Question: Which problems and exercises can nature present to us? Answer: These can be of all kinds. Everything that happens today are also exercises. They seem to us to be too harsh because we are not ready for them; we are so behind in our integral development that we cannot resolve the simplest exercises. We are like students that were left in a class and missed all the materials covered; we look at the records that nature presents to us in the form of pictures and don’t understand anything. A person within the group understands everything because he looks at the world integrally and correctly through the center of the group. For him this is a game. And this game already has a nature which is friendly and good and not dangerous! In that which seemed threatening and lethal to us in the past, we now discover the love and tremendous concern of nature for our development. Opinion (His Holiness the 14th Dalai Lama of Tibet): “The planet’s resources are being depleted; the number of natural disasters is increasing. This poses new challenges for people. To solve them, we must learn to see the entire humanity as a whole. “In today’s world with its global economic and environmental problems, the state borders become secondary. The same can be said about religious differences. Global challenges, rising before us, go beyond the framework of countries and religions. They relate to the entire humanity, and therefore we must act together. “Through education, we can change people’s thinking, so that their priority becomes not self, but the global we. Each of us is part of a greater we. Conversely, the whole world is part of each of us. So, it is in our own interests to seriously take care of the welfare of the entire humankind and the environment. “The idea of socialism is founded on the welfare of society as a whole, but not of one individual. Marxist economy talks about the equal distribution of wealth. And in capitalism, everyone pursues only his own profit. “We can change the world only by relying on people’s goodwill, through education, rather than by force. My Comment: The conclusions are correct, but there is no solution, only wishes. But it is also good—if it is heard. Usually, people nod in agreement to those like the Dalai Lama and then forget. But they need to hear, and then, with appropriate suffering, they will remember not only wishes, but also will find the solution: integral education. Mom, You Bought Me What? Baal HaSulam, “A Speech for the Completion of The Zohar”: Had it not been for the engagement in Torah and Mitzvot Lishma (for Her Name), to bring contentment to the Creator with them, and not to benefit ourselves, there would have been no tactic in the world that could help us invert our nature. If we try acting on our own, we won’t have the slightest chance. Only by engaging in the Torah, i.e., the Kabbalistic methodology with the intention Lishma can we invert our nature. First of all, there is a problem with the terminology: I don’t know what the Torah and the commandments are or what the intention Lishma is. It’s clear only that it is about some remedy, some “working tool” by which we can convert our evil inclination into a good one. How can we possibly understand it? From my current egoistic state (1), I have to transition to the next, altruistic step. 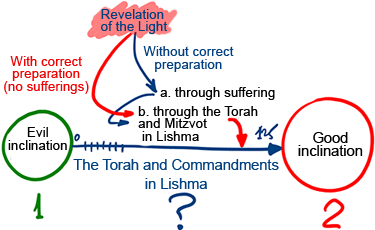 For that, I have to cover a certain path that is called “The Torah and Commandments (Mitzvot) Lishma” (2.) Even though in the beginning I don’t understand a thing, I am facing a given “reality” that I cannot hide from. I am originally placed in this reality and I am on this path, which becomes extremely hard if I don’t have a desire to learn how to implement the Torah and commandments to obtain a correct intention. by the path of Torah and commandments. We are told that there are two options that we have to choose from. And don’t even think that the path of suffering also leads you forward. Simply each time when you are not ready, first you go by the path of suffering and then you go to the implementation of the Torah with the intention Lishma. It’s impossible to advance under the blows because we have to become wiser and more experienced on our path; we have to understand more and assemble fragments of the system into one picture, etc. And it all depends on our readiness to reveal the Light that descends to us. The Light comes to us and we can immediately make a step forward without suffering on the benevolent way if we are prepared for this beforehand, but if we are not prepared correctly, we will plunge into sufferings. Question: What kind of “benevolent Path” is it? Is it really so smooth that we go without a hitch? Answer: “The good path” is that no matter what happens to us, we still find it pleasant, beautiful, and great. The difference is in the preparation. It is hard to understand, yet. Imagine a mother brings home a book and gives it to her son. Her son thinks that it is an adventure story about pirates and treasures, but after unwrapping it he sees that it is a math book. That’s a pity! His mother is bad now and the whole day is awful. However, if he is a smart boy, properly prepared and willing to become a “great man,” he will understand that he needs to learn more. In this case, he’ll get upset if his mother gives him a storybook with pictures. After all, he doesn’t need pirates; he needs knowledge. Then, he will be overjoyed to receive the textbook; this is a gift! His mother is good, the day is perfect, and all of life is an adventure. Proper preparation turned mathematics into real delight. Thus, the whole question is what does one consider a pleasure and what does one want to achieve? The same Light comes down to us; however, it can bring us suffering and darkness—dark instead of daylight. Without proper preparation the Light is too strong for our vessels, desires. The Light and vessels don’t “fit”: The Light is not absorbed because we cannot shield it with the Light of Hassadim. So, it turns into darkness for us. In fact, there is no darkness. The sensation of darkness is caused only by the fact that we cannot accept the Light in the clothing of Hassadim. Question: Still, does the good path allow us to avoid pain that comes from changing our own nature? Answer: Ideally, you won’t feel any pain at all. However, as Baal HaSulam writes, we practically move ahead not through suffering, nor by the path of the Torah, but rather by our “corporeal”, “middle” path in which all the differences occur. And yet, at the same time, we can maintain connection without detaching from the spiritual process and we can understand why we get whatever we go through. Our readiness is variable, but we know we are on the path and it all depends on our preparedness. Question: Why am I “knocked off” my feet while I am on my spiritual path? Why does it happen to me if I am already trying to hasten time? Answer: You are not “knocked off” your feet! 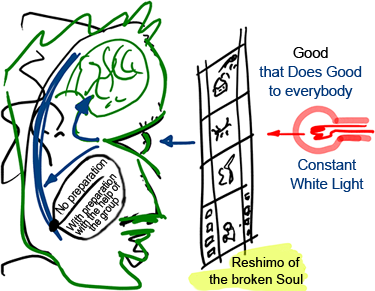 You are shown the broken Reshimot (spiritual genes) inherent in your soul. The Light comes to all and shines for all equally. However, new Reshimot appear in us every moment and that’s why we see black or white “stripes” against the Light. Once, a spiritual vessel existed that was corrected and perfect. The Light poured into it. Then, the vessel was corrupted, and now it’s as if we are watching a film about it, frame by frame. There is a “light bulb” in a spiritual projector, and a film is running in front of it that shows various images: people, animals, houses, etc. The entire movie, all these shots, is, in essence, just the Reshimot of a broken soul. This is how we see them while we are “on this side” of the projector. Our brain perceives these “pictures;” we “see” them with the part of our brain that works as a screen where images of the surrounding world are depicted to us. Question: How does this “movie” become different if we accelerate our path? Answer: The difference is whether we are prepared or not. It depends on us, on how we build our advancement: whether we are “on schedule” or we accelerate? How can we hasten the process? We can do it with the help of the group. It turns out that we have everything we need. We are given very specific things that we require. How many years do we have to look at this mechanism to finally understand how its works? If the group is properly prepared, we welcome the “film” like a boy who cherishes a textbook and not entertaining fiction. We accept the “frames” of our lives and learn how to enjoy them. It’s no coincidence that the modern world is in crisis. Where did it come from if technically speaking we can correct all problems? Before, small crises pushed us ahead, whereas now, no matter what we do, we don’t improve things, any changes will be only for the worse. Today all of humanity watches this “movie” and sees a series of new conditions that are caused by the lack of connection among us on a global scale. That is why we have to be concerned about our general correction. Accordingly, without correct preparation, all subsequent “frames” will appear to us in very unpleasant forms; each time they will become worse and worse. After all, the spiral of Reshimot continues to unfold; they reveal in us one after another, thus depicting the picture of the world to us. It means that there are no other remedies except the right preparation of an individual, a group, or all of humanity. Everything depends on preparation. The Light can come or not to the screen (Masach) in the head of a Partzuf. If there is no screen, the Light will be go to the force of restriction (Tzimtzum) even though it wants to enter inside the desire. In this case, the Partzuf will completely fall into impurity. If the Partzuf has a screen, it will accept the Light as something it aspires to; it attaches to the Light and produces and interaction with it (Zivug), connection with the Creator. In his article “The Peace,” Baal HaSulam writes: This is done by the law of development imprinted in Creation against humanity’s will, where the deeds of the wicked themselves necessarily instigate the good deeds, as we have shown above. We are all under the influence of this law that drives us forward through suffering. However, the Creator gave man the mind and power and let him control and guide the law. It is possible to accelerate and boost the process of development at will freely, independent of time. How can we realize this opportunity that was given to us? Our desires are irrelevant; they always remain absolutely the same and we cannot diminish, increase, or develop them in any way. We have to forget about them as if they do not exist, because we do not control them. Kabbalah says that it is only intentions that we can control. It’s not about limiting our desires, nor is it about what we should do with them. It is written so, but what’s implied in these words is the intention. However, if we are able to somehow change our intention, how do we do it? For that, this world is given to us. We are in a very interesting state: As opposed to spirituality, we can kind of act altruistically, bestow, connect and love with the intention “for our own sake.” In other words, this world lets us deceive ourselves. This interesting state is under all the spiritual worlds. 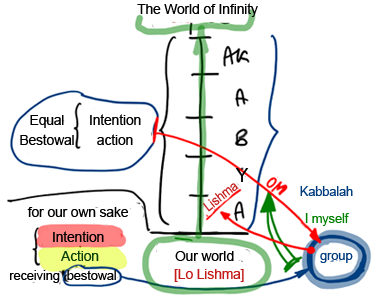 Five worlds descend from the world of Infinity to our world: Adam Kadmon (AK), Atzilut (A), Beria (B), Yetzira (E), Assiya (A), and the very last, our world. Usually we think that it is a very primitive, worthless world. In fact, it’s not so. Here, we can act with intention. Intention and action exist in all other spiritual worlds, but there they are united and equal; there, they act only to the extent of their intention to bestow. In this world, it is opposite: One can act both for the sake of receiving and bestowing simultaneously. At the same time, our intentions are directed solely at receiving for our own sake. In other words, in this world we can perform actions that are opposite to intentions and have intentions that contradict actions. It is a very interesting phenomenon. When we watch a small child, we clearly see his simple actions and very plain intentions: He grabs everything only for himself. Animals act the same way. It’s obvious. That’s why we love them, since they don’t lie to anyone; their actions and intentions do not contradict. They totally lack guile. A grown man acts externally with internal intentions. He can be very polite, respectful, and kind and at the same time pursue a goal that might hurt someone only for the sake of his own benefit. However, this opportunity is given to us only in this world in which contradictory actions and intentions are possible, to completely objectively and independently start our ascent to the upper world. We are the ones who choose how to rise to spirituality because we are given the opportunity to act for the sake of bestowal, although our intentions remain evil—for our own sake. How can we pull ourselves to the upper world? It’s very easy. We have to place ourselves in a community of people who are given the same opportunity to act and have intentions as other normal, egoistic and artful people in this world, i.e., those who understand their nature at least a little bit. They have a desire to change their intentions, although the only thing that we can actually change is actions, not intentions. If we join this group of people and act supposedly for the sake of bringing pleasure and benevolence to each other, we would like to connect with one another in one unified whole and make mutual bestowal our goal; in this case, we act correctly, for the sake of bestowal, but our intentions are wrong. We cannot do anything about them. However, if we study Kabbalah together, in a group, we learn how the unity of intentions and actions are implemented in the upper worlds. Then, a special illumination descends from the upper world to us and changes our intention. Under the influence of the Surrounding Light called Ohr Makif (O’M), which is a special energy, an extraordinary force, we start changing; to the degree of our transformation, our surroundings also modify from “for the sake of ourselves” to “for the sake of others” or “for the sake of our friends” and later on for the sake of something greater and higher. This is how we approach a state of Lishma and begin sensing ourselves in the intention to bestow. To be in the intention to bestow is to exist in the upper world because in this intention we start perceiving totally different, higher properties of matter. We start exiting ourselves, from our state that is limited by sensations of this world, and as a result, we rapidly move ahead to the same goal nature leads us to. By voluntarily aspiring ahead, we avoid suffering. Our sufferings are now called “afflictions of love” since now we think of how to move ahead more effectively, how to better trigger the Surrounding Light to us, and how to faster change our intentions. We perform minimally required actions in regards to the group and humanity, since humankind has to rise to the same goal: to change from the intention “for one’s own sake” to “for the sake of others.” Physical actions do not matter much. We need them only to show the place where we can implement the power of the Surrounding Light, the force of the Light of correction. Therefore, the study of Kabbalah, which tells us about what is perceived with the help of correct intentions—the so-called Light of Bestowal (Ohr Hassadim) and the Returning Light (Ohr Hozer)—helps us change our intentions and start sensing and attaining the upper governance, the upper force. It explains why we need our friends so much, because only among them, only between us, can we make internal work that corrects our intentions. This is why our main goal is to reach a desire to attain a new state that is pre-destined by nature and to pursue it. Nature wants to take us out of the state named “this world” in which we are present today and raise us to the world of Infinity. This is our final goal. If we clearly understood these things, we’d know that it is most urgent and essential for us to create groups that interact with each other in all their parts so that all our actions are directed to some kind of bestowal. By acting this way, we can evoke the correct Surrounding Light to us during our classes and it will correct our intentions. Kabbalah tells us that all the Creator made was just one desire— Malchut of the world of Infinity. 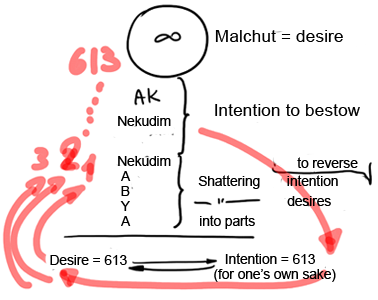 Then, in this desire emerges the intention that goes through shattering (shevira) in the world of Nekudim. Further, in the worlds of Atzilut (A), Beria (B), Yetzira (Y), and Assiya (A), it gradually starts to resurrect, whereas in this world, desires and intentions remain broken into 613 parts. Our work is in the correction of the intention “for our sake” to the intention “for the sake of bestowal,” “for others’ sake” in each of our desires. Then a desire will be considered corrected. In other words, when we study the science of Kabbalah, the Surrounding Light descends to our intentions; in their turn, they attach to desires, and then corrected desires enter the upper world. This is where we start sensing the spiritual world. Thus, by gradually correcting ourselves, we rise to the level of 613 desires until we reach the final correction.